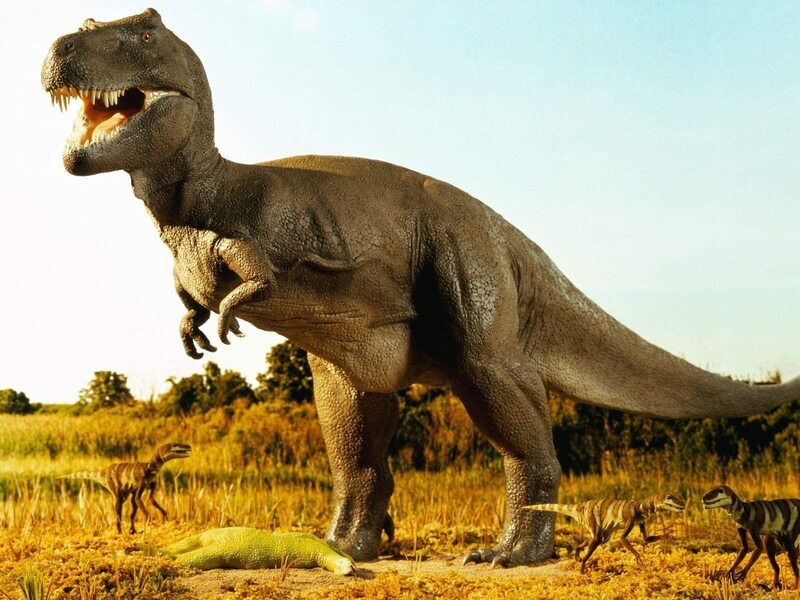 1 – Dinosaurs (‘terrible lizards’) lived on the earth during the periods called Triassic, Jurassic and Cretaceous, which together made up the Mesozoic era. This era ran from around 250 to 65 million years ago and therefore lasted for about 185 million years. During this time the world changed a great deal, with all the continents in one big block called Pangaea at the start, and gradually separating into something resembling our modern earth (except that Antarctica and Australia had yet to part) by the end. This period, incidentally, also saw the first flowering plants and insects. 2 – The dinosaurs’ proper name is ‘Dinosauria‘, and within dinosauria there are two main groups – Saurischia (‘lizard-hipped’) and Ornithischia (‘bird-hipped’). Saurischia included the mostly carnivorous bipedal Theropods (eg T Rex) and the long-necked, long-tailed herbivorous Sauropods (e.g Argentinosaurus and Diplodocus), while the Ornithischia were all herbivores, both bipedal and quadrupedal (e.g Iguanodon and Ankylosaurus). 3 – The earliest dinosaurs developed in the Triassic era around 228 million years ago, and one of the first was an ancestor of the lizard-hipped saurischias, eoraptor, a near-complete skeleton of which was found in 1991 in Argentina. It was a bipedal carnivore and looked a lot like its descendants, the raptors that chased our heroes through the abandoned facility in the aforementioned movie – but it was a lot smaller, weighing just 22 lb (10 kg) and being about a metre long. 4 – The first dinosaur that scientists named was the lizard-hipped sauropod Megalosaurus (‘great lizard’). However, when the first bone, the end of a femur, was originally discovered in 1676, it was thought to belong to some kind of giant human and, because of a superficial visual resemblance, it was labelled ‘Scrotum humanum‘! Fortunately, by the time more bones had been discovered and a serious effort made to identify them accurately, it was realised the ‘giant’ animal was more like a lizard and in 1824 the less fanciful name ‘Megalosaurus bucklandi‘ was assigned. It was named after William Buckland, an Oxford geology professor who did a lot of the research on the bones and published descriptions in the Geological Society’s journal, ‘Transactions’, that year. 5 – The most famous dinosaur of all, Tyrannosaurus Rex (‘Tyrant Lizard King’) was one of the fiercest predators that ever existed – and it was also one of the last dinosaurs, being one of the many that were wiped out by the catastrophe that destroyed that entire section of the family tree of life around 65 million years ago. Although it’s not known for certain what happened, the mostly likely reason is that the massive asteroid that crashed here at that time caused changes to the Earth’s weather systems that were too extreme for these animals to be able to adapt. 6 – Having said that, fossil records indicate that birds evolved from dinosaurs so there is a basis for the claim that dinosaurs still live among us now. One of the fossils that demonstrate this was the Archaeopteryx, which has characteristics of both sides – it was basically a dinosaur with feathers, but it was only when fossils were found with the feathers extremely clearly delineated that scientists believed it existed! 7 – One of the first dinosaurs to be extensively studied was the bird-hipped Iguanadon (‘iguana tooth’) – in fact, it was one of the first three fossils to be used to define ‘dinosauria’ in the first place, and only the second to be named (after Megalosaurus). This 3-tonne, 33 ft (10 m) herbivore usually walked on its much larger back legs, but its forelegs were large and strong enough that it could use them to walk on all fours if it wished – its proportions were a bit like a modern kangaroo (although it never hopped, just walked!). It was slightly quirky in that it had conical spikes for thumbs that stuck out at 90º from the rest of the digits and its high, narrow skull ended in a beak-like mouth containing the aforementioned iguana-like teeth. 8 – The smallest dinosaur we know about is a theropod called ‘Anchiornis huxleyi’ which was about the size of a modern pigeon – its total length was about 1.1 ft (35 cm) and about 100 g in weight. 9 – At the other end of the scale, the largest dinosaurs are probably the largest land animals that ever existed and although we don’t have complete details, scientists believe that the largest so far is the massive herbivorous sauropod Argentinosaurus, discovered in Argentina and named for that country in 1993. From the few bones found to date they have extrapolated that could have been up to 115 ft (35 m) long and weighed up to 100 tonnes! There are, however, tantalizing fragments of bones that lead scientists to believe they haven’t yet discovered the biggest ever dinosaur (only a tiny percentage of remains ever became fossils and of those, by the far the greatest majority are still underground) but until more is discovered about them, they have to remain shrouded in mystery. 10 – The longest known dinosaur for which reasonably complete remains are available was Diplodocus, another herbivorous sauropod, and at one time scientists estimated it could be as much as 177 ft (54 m) long and 113 tonnes! However, the discovery that some vertebrae had been placed wrong (and one or two weren’t actually from that animal at all) caused them to revise that estimate down by about a third. As with the ‘largest’ dinosaurs, it is thought there were probably longer ones but with only fragments found so far to hint at their existence no real estimates can be made. Yet. 11 – The tallest known dinosaur is also a sauropod herbivore, the Sauroposeidon (‘earthquake god lizard’! ), and at 59 ft (18 m) tall he could have looked into a sixth floor window with ease. The entire animal is thought to have been up to 112 ft (34 m) long and up to 60 tonnes in weight. In fact, the bones were so large and so old that originally it wasn’t realised they were bones at all, and they were misclassified as petrified wood! 12 – The largest (and longest) carnivore (that we know about so far!) is the sauropod Spinosaurus (‘spine lizard’), named in 1915 for the large fan or sail of (probably webbed) spines along its back, which could have weighed anything from 9 to 21 tonnes (depending on whose calculations you use) and been up to 59 feet (18 m) in length. The function of the spines is not really known, but best guesses include thermoregulation and display in mating rituals.